What is the message of The Humane League for anyone who may not have already heard and what is different about you from other animal charities? Our focus has always been on creating the biggest impact for animals. 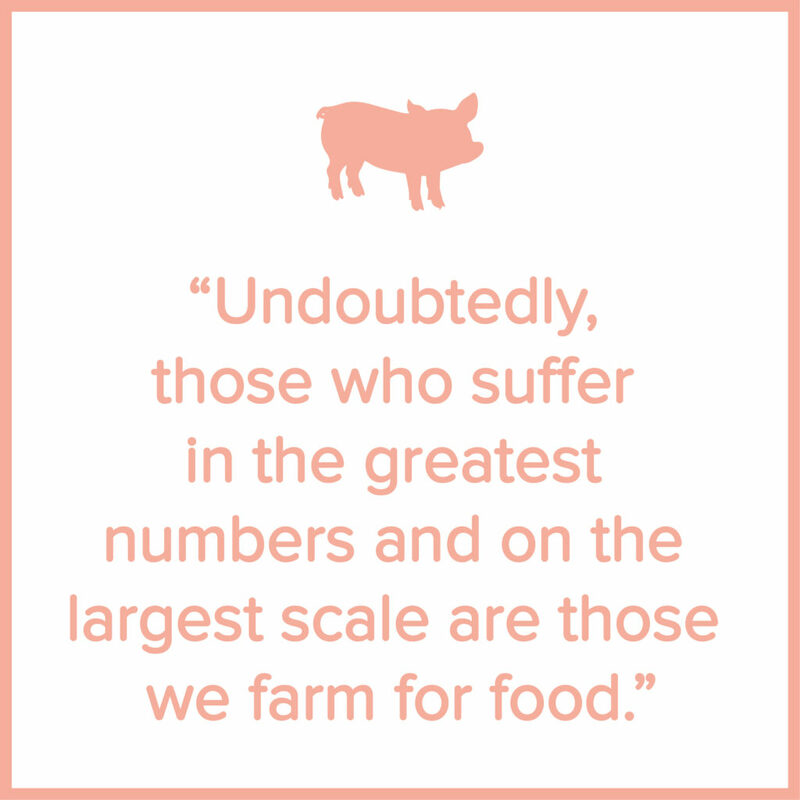 Undoubtedly, those who suffer in the greatest numbers and on the largest scale are those we farm for food. 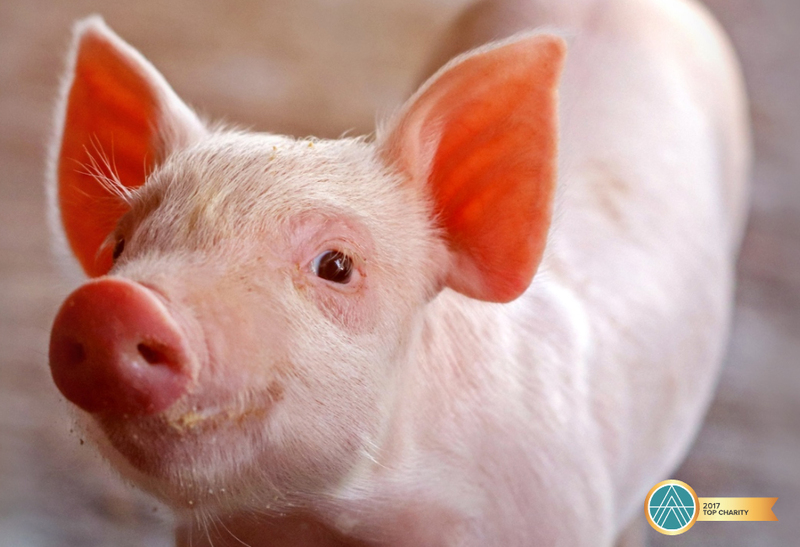 Our overarching ethos is to identify where and how farm animals suffer the most and apply a laser-like focus to changing that. Cages are arguably one of the cruellest contraptions on the planet, so in recent years, we have been campaigning to reform the egg industry and make cages a thing of the past. 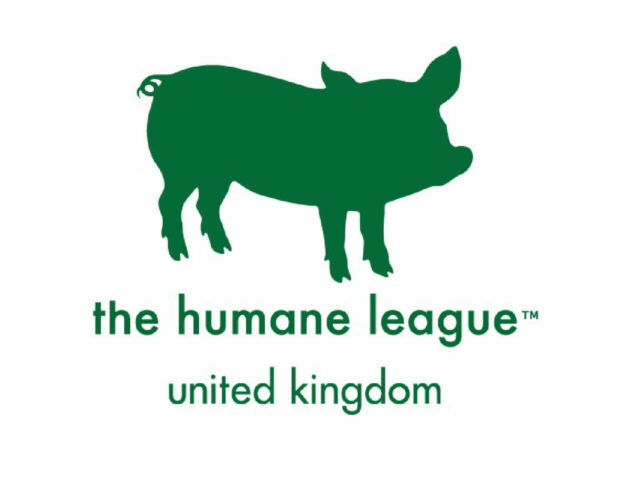 The Humane League’s approach has filled a significant gap in the activities of farm animal protection in the UK. Our approach is different from others to date: we will work with or against companies. We will always reach out to a company and encourage them through private dialogue to improve their standards of their own will. However, we will campaign hard against any company that is unwilling to progress their welfare standards, to ensure it is publicly known that there is no desire by the company to end the use of eggs from caged hens. It’s a tried and tested approach that we’ve taken from our work in the US. Our campaigns are delivered unapologetically. We won’t shy away from coming at the companies from all angles, letting their customers and stakeholders know about the issue – and crucially, never giving up! We know that you were grassroots like ourselves, as a charity; can you tell us how did the Humane League begin? The Humane League was founded in the United States in 2005 by a small bunch of dedicated and passionate volunteers who wanted to help animals as much as they could. The organisation went from strength to strength and soon grew to be a fully-fledged animal rights group and a force to be reckoned with. Now, we are bringing this drive and enthusiasm to the UK. We have been operating here since June 2016, when we hired our first employee. The team has since expanded to seven members, giving us so much more capacity to advocate for animals. Our expansion was made possible by funding from the Open Philanthropy Project, an amazing organisation which delivers grants to groups working on important causes. 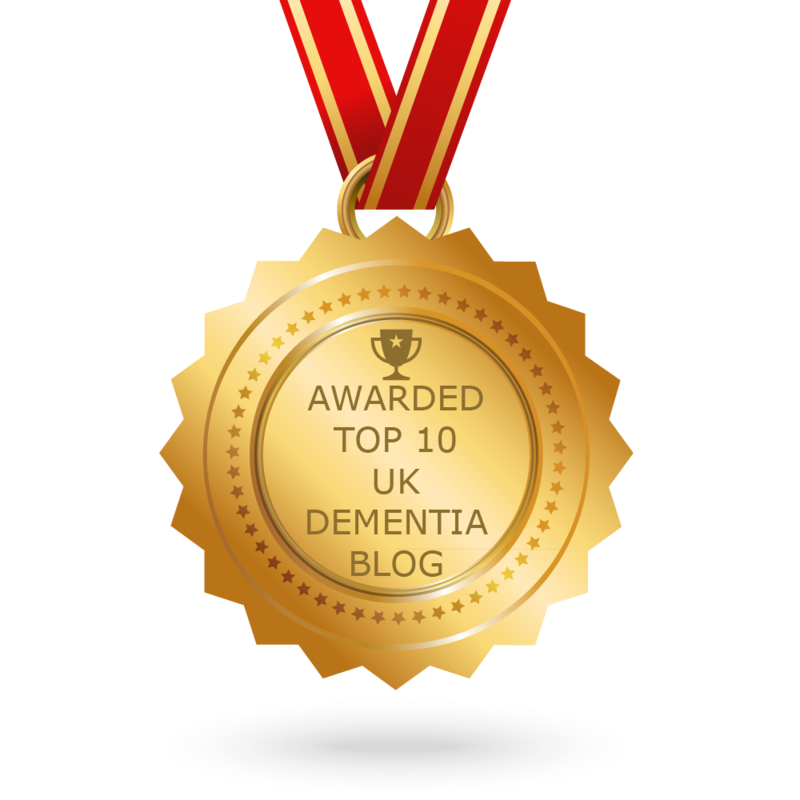 We can see from your website that you were awarded 2017 top charity. Congratulations! We’re completely in awe! Can you tell us a bit about how you achieved that and what it means to you at The Humane League? Thank you. We are thrilled to have earned Top Charity status from Animal Charity Evaluators (ACE), an independent research organization that analyses the effectiveness and impact of non-profits working to improve the lives of animals, and are proud to be the only animal group to receive this distinction for every rating period. ACE specifically highlighted The Humane League’s work on corporate campaigns, which has pressured many companies, like Subway and Starbucks in the US, to commit to meaningful welfare policies for chickens raised for meat. 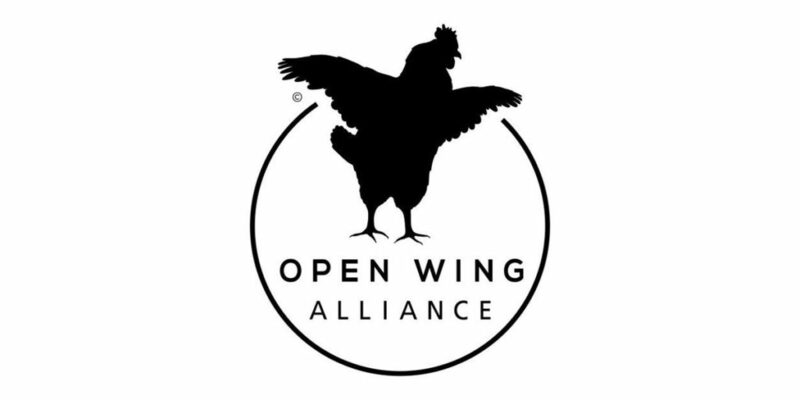 ACE also focused on our movement-building accomplishments through Open Wing Alliance, a coalition headed by The Humane League that is building and strengthening farm animal advocacy around the world. What is the greatest success for The Humane League to date? In the UK, without a doubt, our greatest success would be our recent victory in our campaign against the UK’s biggest egg producer, Noble Foods. It owns well-known brands such as The Happy Egg Co, Gü Puds, and Big & Fresh. Its website is plastered with claims of caring about animal welfare. Shockingly though, it keeps 4.3 million hens in cramped, crowded cages. For six months, we took to the streets for scores of actions and protests to bring this issue to light. We caged ourselves under supermarket trolleys in Asda and dressed up as ‘zombie chickens’ for Halloween. We turned up on their doorstep bearing Christmas gifts of coal and made a romantic ‘proposal’ to go cage-free for Valentine’s day. We were outside their offices in the middle of a 4.3 day-long occupation when we got a call to say that Noble Foods had finally committed to stop farming hens in cages. We were euphoric. Undoubtedly the success of the campaign was in no small part down to all our volunteers, and the members of the public who were driven to join the campaign by their outrage at this cruelty. Why is factory farming so bad and for those who don’t know, what are some commonplace “normal” everyday occurrences for most farm animals? Farm animals suffer in almost unimaginable numbers. Every year alone, nearly a billion animals in the UK are slaughtered for food. Laying hens who produce eggs are slaughtered after a year of production, and around a half of the 36 million hens in the UK are raised in enriched cages. For hens, life inside a cage is really no life at all. They have no meaningful opportunity to do the things that make a hen happy. For their entire productive life, they are crowded in among their stressed cage mates with little more than an A4 sheet of paper worth of space per bird, unable to perch high at night or forage at the ground. The so-called ‘enriched’ cages contain a sad offering of a nest box – a few flaps of plastic hanging from the ceiling of the cage to create a ‘darkened’ area. There is no solid floor, or straw, or anything we would recognise as a ‘nest’. Hens are highly motivated to carry out natural ‘hen’ behaviours. Being prevented from doing so causes immense stress. Chickens raised for meat also suffer immensely. They are genetically engineered to grow so big, so fast, that their bodies can’t cope, causing no end of welfare issues. We have started leading the way in efforts to reform the chicken meat industry in the US and will be working on this issue in the UK too. 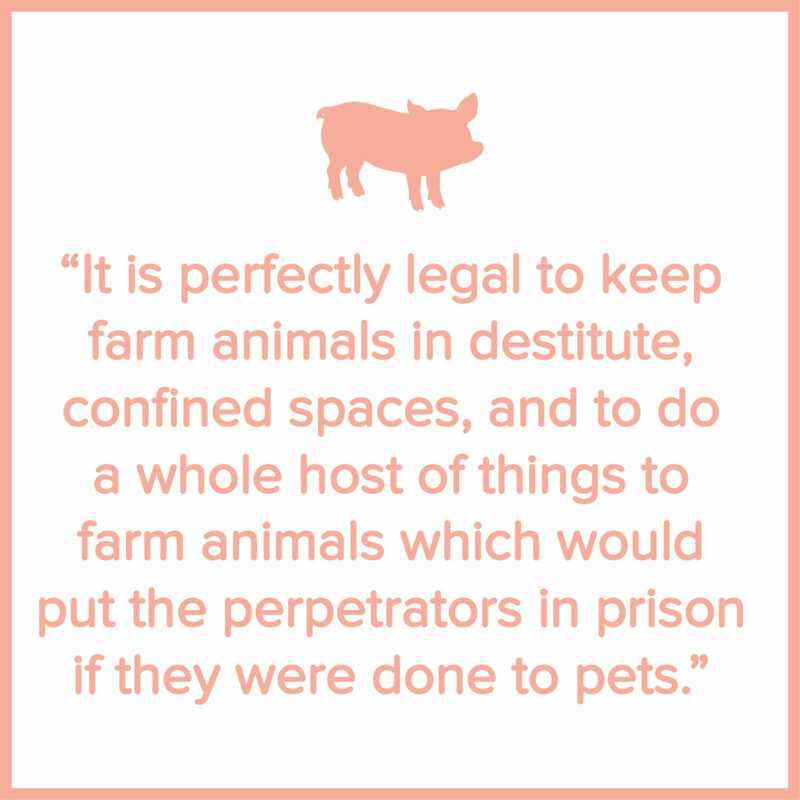 It is perfectly legal to keep farm animals in destitute, confined spaces, and to do a whole host of things to farm animals which would put the perpetrators in prison if they were done to pets. This is why fighting to improve conditions can bring about meaningful changes for animals on factory farms. For those reading this wanting to do better but who may still be on a meat-eating diet, what advice and encouragement would you give them if they wanted to start living more mindfully, with kindness and thoughts of sustainability and health in mind? Switching to a plant-based diet is easier than people might think. There are loads of fantastic resources such as Veganuary’s Vegan Starter Kit which are a perfect starting point for those who don’t yet know much about how to reduce or eliminate animal products in their diet. Food companies are embracing the movement by increasingly catering for vegans, making it so much easier to eat out. Not so long ago, it would be common to only find chips and salad in a restaurant, but now eateries are offering a whole host of plant-based options. To make it easier for businesses to cater for vegans, The Humane League teamed up with Veganuary and Vegan Chef Day to produce a Catering Guide. The guide enables businesses to expand and improve their vegan options without having to make sweeping changes to their menus or ingredient supply. In many cases, this simply means ‘veganising’ options already available, replacing butter with oil or providing an option to remove cheese. In others, it entails introducing new options which make use of the kitchen’s ingredients. Our advice would be: give it a try, it’s easier than you might think! How can people change their mindset? Advocating for animals raised for food carries unique difficulties because eating animals is so normalised across the globe. Changing these habits is a challenge, but as is being proved by the boom in veganism, an achievable challenge. There seems to be a real awakening to the plight of farm animals across the world. The explosion of social media has played a huge part in raising awareness, by making information easily accessible and shareable. For years, agricultural intensification went largely unnoticed by the public, who still assumed that their eggs and milk came from the farm down the road. Companies with massive advertising budgets could easily dress up factory farmed products to make them look wholesome and humane. 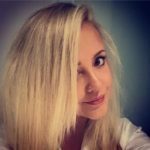 Now, it is getting easier to disprove the myths that the industry attempt to peddle, because we can reach people who care and join forces more effectively. How can someone reading this help The Humane League, right now, today? The easiest, quickest thing you can do is to sign up to our Fast Action Network at www.fastactionnetwork.com. You’ll receive regular alerts about really easy actions you can take to drive our campaigns against corporates – from sending emails, to making quick phone calls, or posting on a company’s Facebook page. If you’re looking to volunteer or get involved in effective animal activism, please get in touch. There are so many ways to help – and achieving progress is so rewarding. Thank you Humane League, it’s been an absolute honour speaking with you.